Paul McGann and his friend Kenneth Ashley-Johnson have put in motion a plan to have Woodwarm stoves in their Eco-tourism project in the beautiful, land locked, Himalayan country of Nepal. Three Woodwarm Wildwood stoves are being shipped out to Shivapuri National Park (www.shivapuri.com.np). Shivapuri at 2000metres above sea level has a range of temperatures to cope with but it will be the freezing night time temperature where the Woodwarm Wildwood stoves will come in to their own. The super efficient stoves will have plenty of local sustainable fire wood to keep them warming soft eco-tourists as well as the hardened local villagers. The stoves are being shipped to Shivapuri by the good offices of www.panavision.co.uk and we will keep you posted on the journey to Nepal. 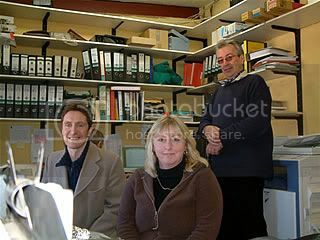 photo: Paul, Sarah and Rupert with the hard working Sandy and Steve in the background at the Woodwarm office in Cullompton.